As you may recall, I am a huge NASCAR fan. This was the first race I was able to attend since September of 2013, when my brother, sister-in-law, and I did a bus trip to the Dover race. Rose, when she moved to a city only three hours’ drive from me, offered to go with me to one, and since her husband could be transferred away again before next season, I jumped on it this year. How does this relate to Jane Austen? Well, there are several hundred horses (so to speak) under the hood of each of those race cars. I got to thinking about the difference between racing these kind of horses and how people raced horses in the Regency period. Did they feel the same thrill at the start of a race as I do when forty engines fire up all at once? Did they get excited when the horses ran past on the front stretch, like I do? Better yet, can they feel the vibrations of the cars passing while they are in the ladies’ room sitting on the potty? Oh, oops…I guess not. blush At any rate, I decided to compare the racing experience then to mine now. One of the first things I learned in my research was that the Ascot was established by Queen Anne in 1711 on land purchased specifically for horse racing. The Prince Regent made the four-day race a very fashionable event in about 1825, after he became king. He built a stand for himself and his guests to use to watch the races that is still used (and hard to get into). And, even though a queen established this formal race, most of the time, ladies did not attend the races in the Regency period…only if it was a special event, like (you guessed it) the Ascot. NASCAR was started as a race on the beach in Daytona, Florida, where the sport’s main offices are still located. The first race was in 1948, and a decade later, Daytona Speedway was built. Originally, drivers drove stock vehicles, which means they drove cars that people drove on the street. Nowadays, they have specialized vehicles. I equate the Daytona 500 to the Ascot. It’s a huge event, and draws folks from all over, including U. S. presidents and first ladies. However, at no NASCAR event does anyone wear formal attire as they did and still do at Ascot. Hats, though, are highly recommended. Of course, not every race in Regency England was held at Ascot, and not all were formal affairs. Other tracks included Epsom, Newmarket, Goodwood, and others. Often, small races would be held in local towns during the assizes. I think attendees at those races would look more like today’s race fans…dressed informally. Where did racegoers sit? Well, during the Regency, they generally did not. They stood at the rail. A Cambridge student who attended a race in 1816 wrote of the huge crowd, so I’d imagine most attendees could not actually see the race. Today, at NASCAR races, there are still huge crowds, but with grandstands and private/corporate boxes, everyone who attends can see the action…unless they are stuck in line at the concession stand or in the bathroom. 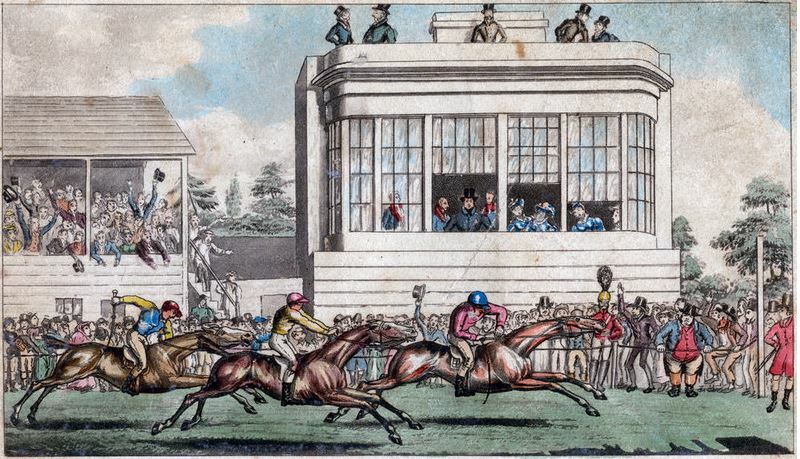 My research did not reveal details about pounding hearts and excitement from anything other than won or lost bets during horse races in the Regency, but I like to think that for someone back then, it was an exciting sport. WE HAD SOOOOOO MUCH FUN!! I only wish our visit could have been longer! I’m glad the race was a blast, and can’t thank you two enough for making time to visit with me and my husband. We enjoyed our scenic drive and time with you both immensely! Thanks for sharing. I used to follow Nascar and was a big E Senior fan. You made me think of the Ascot Race scene from My Fair Lady with Audrey Hepburn. I was thinking of the same thing! The part where they all sing about how they have never been so “keyed up” in their lives, as they sit rigidly in their best clothes, not moving a muscle. NASCAR would probably be more fun than that! Great post! Thanks for informing me on races past and present! I had so much fun! And your next book should include a race! Maybe Lizzy and Georgie meet at the Ascot? How neat that three Austen Authors were able to have lunch together before you and Rose went to the races. I cannot imagine walking into a restaurant and finding three authors [that I’ve read] sitting together. I think it would blow my mind. I would never disturb your privacy…but, I would smile at you as I passed the table. You know, back in the day before technology, those who attended the KY Derby, and went to the infield, didn’t even see the race half the time. In Mansfield Park, Mr. Bertram had his hunter and was always going to races. Most of the time he was unsuccessful. When he was recovering, he had Fanny read him excerpts from the racing sheets. I was trying to think if any other JA character that was enthralled with horse racing. Now that you have retired to the ‘country estate of writing full time’…haha, that might not be a bad idea. Have a stack of post-it notes handy and a notepad and pen. AuAu had a post some time ago [discussing a rewrite on one of the books] that sent me back into the pages, only this time I marked references and by the time I was finished, my book looked like a kaleidoscope of color with all the markers sticking out from the pages. I saw a dozen and one different ideas for stories. You might come up with a dozen and one story ideas…now that you don’t have lesson planning to worry about. Have fun. Great fun! And may I assume your next book includes another race???? How nice you all got to see each other! Jen ?